Focus on your business while the Scan2x captures your documents. Advanced technology automatically applies the right settings, recognises key data and transfers it, making it ideal for optimising efficiency without extra training. 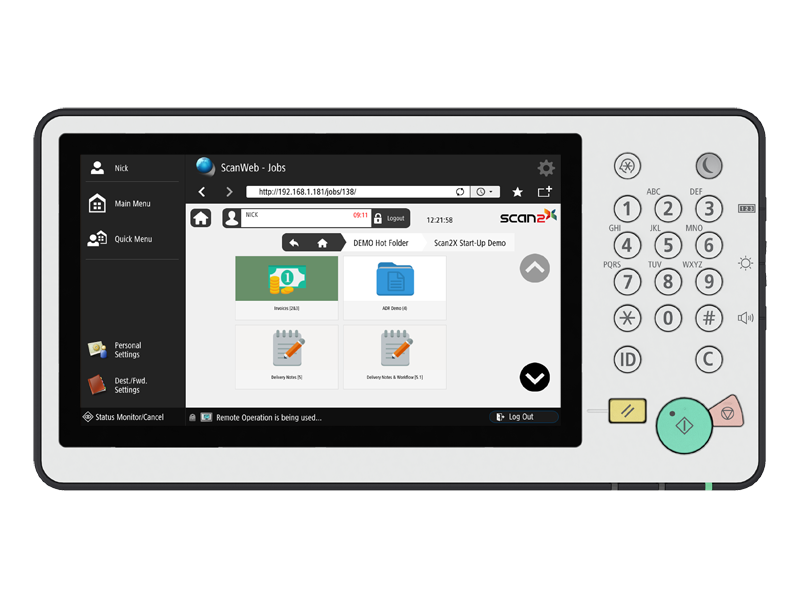 An icon-based interface allows intuitive use while automated processes instantly recognise documents, select the correct settings and extract the required information. Sophisticated technology recognises all kinds of documents for a completely flexible solution, enabling you to shape the software to your bespoke business needs. Put security, compliance and accountability first with PIN numbers for each user, optional swipe cards or a fingerprint reader for a responsible and secure paper trail. Automate processes to ensure compliance with ever-increasing regulation, including redaction of sensitive personal data to aid with GDPR legislation. TWAIN compatibility and integration with Therefore™, Sharepoint™, cloud services, FTP, databases and web services ensure uninterrupted productivity.